This article explains the concept of the Sales Funnel in a practical way. After reading it, you will understand the basics of this useful marketing strategy tool. For any commercial organization, it is important to have and retain a good customer base. Nevertheless, it is also important to attract new customers. However, the big question is how new customers are attracted to a company and how they end up at a company. Which ways can they be approached and what happens if they make a purchase and subsequently make repeat purchases? The Sales Funnel provides insight into this and shows the way online marketing works. The so-called Pareto principle applies to the sales funnel. According to this principle, introduced by the 20th century French-Italian economist Vilfredo Pareto, if 20% of energy is devoted to something, it will ultimately generate a result of 80%. Likewise, if 80% of effort is put into something, it can ultimately only reap a result of 20%. This parallel also applies to large companies and their customer base. In most cases their biggest clients account for 20% of the total customer base. This group of regular customers is often responsible for 80% of the total company revenue, the so-called recurring revenues. The same applies the other way round: small customers who make purchases from time to time, account for 80% of the total customer base. However, their joint revenue does not generate more than 20% of the total revenue. It is therefore attractive for many companies to mainly focus on their regular customer groups. A classic mistake, as these customers may decide, for whatever reason, to purchase products or services from a different party. Instead, especially among these small ‘sporadic customers’, there may be customers that will grow and increasingly purchase more products and/or services. This is where the Sales Funnel comes in. It’s is an online marketing tool that works like a funnel. Not only the large regular customers are important, but particularly those tiny customers or customers that are still relatively unfamiliar with the product and/ or service of the organisation, can grow and make a fine contribution to the revenue. The Sales Funnel is often used as an online marketing tool. It describes the process of how visitors become actual customers, also called the Customer Journey. Not every customer is aware of the products and/ or services a company offers. The customer that is aware of the products and/or services a company offers will not necessarily purchase something immediately. A customer who is, for instance, looking for a company coffee machine will initially visit multiple locations, request information from various parties and ask for multiple quotes prior to ordering one from a single company. The sales funnel shows the customer journey, as it were, which a customer makes prior to purchasing a product. It often starts with a first visit to a website. Before the first layers of the sales funnel are described, we will first explain how to fill the Sales Funnel. The online marketing tool focuses on attracting customers via websites and social media. It is important for companies to realise that frequent publications help to attract online customers. This means that a website must offer sufficient information with the option to submit requests via so-called Call-to-Actions (CTA) or by clicking. Free content offers, such as a white paper with specific information or an e-book, can provide lots of information about the client via specific software. Other publications such as blogs, newsletters and emails also attract customers. Interaction with customers is also a great way to fill the sales funnel and to entice the visitor to become a customer. This can be accomplished by, for instance, giving webinars for which visitors need to register first and will subsequently be subscribed to the newsletter program. This is called ‘list building’. Encouraging customers to have a free, no obligation consultation or to request quotations are also ways to attract customers. The top of the funnel will be filled with many potential customers who are not yet familiar with the product or are not aware that a company produces a specific product. It concerns potential customers who are looking for a company coffee machine, though do not know which companies supply them. These are potential customers who are looking for information in a more specific manner. They will visit the website and read reviews, amongst others, on social media. This concerns people who are already familiar with the products and/or services and know where they can possibly purchase them. In one way or another, they come into contact with the company, though are not yet ready to buy anything. By encouraging them to request information or to leave their details behind, they will automatically become leads. These are potential customers. This concerns potential customers who are familiar with the company and its products and are interested. They have actually subscribed to a newsletter, provided their contact details via a contact form, requested a free sample or quotation. A company has put feelers out to this potential customer. It is crunch time. Doing nothing is not an option, though bombarding leads with information can be perceived as overly pushy. Therefore, leads must be handled with care. This is basically another name for a lead. However, the company has a slightly longer relationship with a suspect than with a lead, who for example, has only just subscribed to the newsletter. If after one year of vain attempts the suspect has still not made a purchase, you can stop trying and strike the suspect off your list. A prospect will place an order any time now. They can be persuaded by offering them a good deal. It is important to engage in an open dialogue with prospects and to ask what they thought of, for example, a sample. The so-called ‘foot-in-the-door’ technique can facilitate this. As soon as a prospect agrees to a small transaction, it will be difficult for them to turn down a nice offer. At this stage, the customer has become an actual customer, who has made a purchase. It is important that a company does not sit back, but instead continues to actively engage the customer. Now, customer satisfaction will start to play a role. Therefore, there is a significant chance that another purchase will be made or purchases will increase. These are repeat customers, who are happy with the product and service and share their experiences with their direct environment. Therefore, promoters give free publicity. The company has the opportunity to – and definitely should – build up a long-term relationship with them. To gain proper insight into how the sales funnel exactly works, it would be smart for companies to use specific software applications that can measure the progress. This software can keep track of, amongst others, the number of visitors of your website. Email marketing software can measure the number of leads and prospects. This kind of software keeps track of which people are on your mailing list, how many emails they have already received and whether they actually clicked on certain links. All this information is invaluable. With analytics software, online shops can also measure how many purchases have been made and who the specific customers were. Landing page software can help to identify the visitors, how long they viewed the page and which parts were read most. 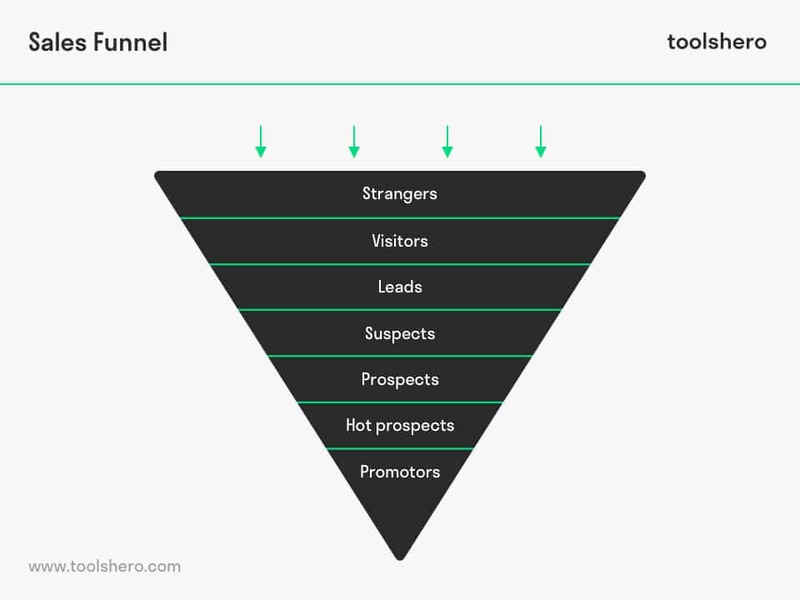 This way, the Sales Funnel analysis can indicate which customers are not interesting and which customers are on their way to becoming potential customers. Many visitors will not necessarily become customers immediately. The data from the sales funnel also shows whether or not visitors are aware of how to easily provide their contact details. All this this information can be applied to make adjustments to one’s website. What do you think? Have you ever heard of a Sales Funnel? Do you recognize the practical explanation or do you have more suggestions? What are your success factors for getting a grip on your online product sales conversion? Cai, S. Q., Yu, Y. P., & Wang, Q. G. (2005). Research on Sales Funnel Model that Supporting Customer Identification and Retain [J]. Chinese Journal of Management Science, 2, 012. Heiman, S. E., Sanchez, D., & Tuleja, T. (1998). The new strategic selling. Nightingale-Conant Corporation. Patterson, L. (2007). Marketing and sales alignment for improved effectiveness. Journal of digital asset management, 3(4), 185-189.